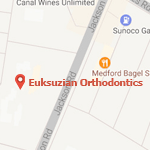 It is Dr. Sarkis Euksuzian’s desire that you never have an orthodontic emergency and, in reality, orthodontic emergencies are relatively rare. However, in the event that something does occur where you need emergency care our office is on call 24 hours per day, every day of the year. Please call the office if an emergency occurs at (609)654-0600. If an emergency occurs after office hours, please call Dr. Sarkis Euksuzian at (609)410-3020. Sore teeth during orthodontic treatment is normal and results from the forces placed on the teeth to move them. You or your child are most likely to experience sore teeth for 1 to 3 days after the braces are first placed and occasionally after a routine orthodontic visit. An anti-inflammatory medication such as ibuprofen (e.g., Advil, Motrin) is very good at reducing the soreness. Also, avoid hard or chewy foods while your teeth are sore. If you experience intense pain or if the soreness persists longer than you think is normal, please call Dr. Sarkis Euksuzian. Pain in the gums during orthodontic treatment is not normal. One possible cause is food trapped under a brace or beneath the gum line. Rinse your mouth several times per day with warm salt water and/or a mouthwash, such as Peroxyl. Brush your teeth and gums with a soft toothbrush and use dental floss and/or an interdental toothbrush (Proxabrush) to dislodge the food. If you experience severe pain or if the pain lasts longer than a few days, please call Dr. Sarkis Euksuzian. Pops, clicks and discomfort are sometimes felt in the TMJ(s) (“jaw joint(s)”) while undergoing orthodontic treatment. These symptoms are usually transient because the teeth and jaw structures are moving into better alignment as orthodontic treatment progresses. Please note, if the pain in the TMJ(s) is persistent or severe, call Dr. Sarkis Euksuzian. You or your child may need to be seen for an extra visit. Braces and some other orthodontic appliances can sometimes irritate the inside of the cheek, especially during the first few days following the placement of braces. A sore spot may develop due to the orthodontic brackets or wires. To help the sore spot heal, place wax on the part of the brace adjacent to the sore spot. Please refer to the topic “Wax” in the Emergencies section for complete instructions on the use of wax. If the wax does not help or if the sore spot seems to get worse, please call Dr. Sarkis Euksuzian. During the first week of wearing your braces, your lips may be irritated from the brackets on your front teeth. If a sore spot develops on your lip, cover the part of your brace adjacent to the sore spot with wax and lubricate your lips with Vaseline or Chap Stick. Please refer to the topic “Wax” in the Emergencies section for complete instructions on the use of wax. If these steps do not help or if the sore spot seems to get worse, please call Dr. Sarkis Euksuzian. Some of your orthodontic appliances may have parts that are on the surfaces of your teeth toward the tongue. This is called the lingual surface. These parts may irritate the tongue for several days as you get used to your braces. To help the sore spot heal and to let your tongue get used to your braces, place wax on the the brace that is causing the sore spot. Please refer to the topic “Wax” in the Emergencies section for complete instructions on the use of wax. If the wax does not seem to help or if the sore spot gets worse, please call Dr. Sarkis Euksuzian. In most cases, a loose brace will remain attached to the archwire and is not cause for an emergency visit. Sometimes the brace may move or slide back and forth on the archwire. Tweezers can be used to reposition the brace if it flips around the wire.If tissue irritation occurs, cover the loose brace with orthodontic wax to help the sore area heal. Please refer to the topic “Wax” in the Emergencies section for complete instructions on the use of wax. Note: loose braces cannot support the use of elastics. If a bonded appliance (e.g., a palatal expander) comes loose, it can cause irritation and soreness in the soft tissues. A loose orthodontic appliance will not move the teeth to their proper positions. This can result in a delay in treatment progress. Do not try to fix these problems yourself. It is important to call Dr. Sarkis Euksuzian to inquire about scheduling an appointment to repair the loose appliance. If the main wire has come out of the brace or tube on a back molar tooth, attempt to reinsert the wire with a pair of needle nosed pliers or tweezers. If the wire is not sticking you, place a piece of wax over the area. If the wire is sticking you and wax does not help, the wire can be cut with a small wire cutter or nail clipper close to the back of the last brace. This is a last resort until you can see us for an adjustment. An archwire that is not attached to a brace will not be moving the tooth as it is supposed to. This can result in a delay in treatment progress. A loose archwire needs to be repaired. If a wire causes irritation, push the wire away from the area using the eraser end of a pencil or a cotton swab. If the wire cannot be tucked away, cover the end of the wire with a small piece of wax, a cotton ball, or a piece of sugarless gum, until you can see us for an adjustment. Please call Dr. Sarkis Euksuzian to schedule an earlier appointment. The metal or plastic parts of retainers or removable appliances may break or get bent. This can cause them to function improperly. In these situations, it may be necessary to stop wearing the appliance. 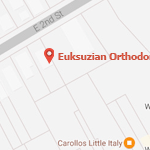 Call Dr. Sarkis Euksuzian. It may be necessary to schedule an earlier appointment to adjust or repair the appliance. If you swallow part of your orthodontic appliance, such as a brace or rubber band, it will pass through your system and be harmless, unless you experience difficulty breathing. If you experience difficulty breathing, seek immediate medical help. Get to the nearest medical facility, whether it is Dr. Sarkis Euksuzian’s office or an emergency room. Orthodontic wax is used to cover loose or broken parts of your braces, hooks, newly placed braces, and other orthodontic appliances that may cause soft tissue irritation or sore spots. To use your wax, take a small piece about the size of a pea. Shape it into a ball with your fingers and apply the wax directly to the part of the braces causing the sore spot. Press it around the part and smooth it with your fingers. Please continue to brush even while using wax. Wax is harmless and can be applied to your braces as often as is needed. If you swallow wax it will not harm you! NOTE: If you happen to run out of wax, sugar free gum can serve as a good alternative. It is very important to keep your teeth and gums healthy during orthodontic treatment. Poor oral hygiene may result in swollen and bleeding gum tissue. Gentle and thorough brushing, rinsing with warm salt water and mouthwash (e.g., Peroxyl) will help return the gums to a healthy state. Also, use dental floss to remove any food or debris that may have become trapped under the gum line. Orthodontic tooth movement may also cause swollen gums. If the steps above do not help the situation, please call Dr. Sarkis Euksuzian. Your braces are designed to move your teeth in all 3 dimensions. Occasionally a tooth may appear to be moving in the wrong direction. Dr. Sarkis Euksuzian would advise you to be patient for a few days. Usually this happens at the beginning of treatment. However, undesired tooth movement can occur when part of your braces are broken or damaged. If you think this is the case, please call Dr. Sarkis Euksuzian. It may be necessary to schedule an earlier appointment to adjust or repair the appliance. Allergic reactions during orthodontic treatment are very uncommon, but they can occur. Some patients may be allergic to the metal in some appliances or to the latex gloves worn by Dr. Sarkis Euksuzian and his staff. If unusual or unexplained symptoms such as swelling or redness in your mouth, or a skin rash appear, please call Dr. Sarkis Euksuzian for advice.